Celiac disease is an autoimmune disorder that makes the immune system react to gluten?a protein found in wheat, rye, and barley. When people with celiac disease eat gluten, this immune reaction damages their small intestine, making it harder for them to absorb nutrients from foods. Celiac disease is not the same as gluten sensitivity. People who are sensitive to gluten develop symptoms similar to those of celiac disease when they eat gluten-containing foods, but no damage is occurring in their intestines. 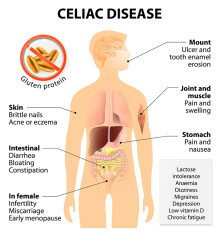 An estimated 1 out of every 141 Americans has celiac disease. Most of them don?t realize they are living with the condition. That?s why it?s important to become familiar with celiac disease symptoms, and talk to a doctor if you have them. 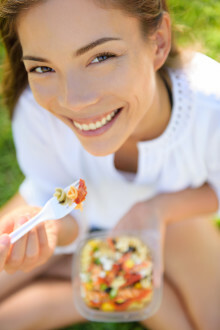 Digestive issues are the most typical celiac disease symptoms, particularly in children. These symptoms include bloating, diarrhea or constipation, gas, stomach pain, nausea, vomiting, or foul smelling stools. In babies and children, celiac disease symptoms can also include slowed growth, weight loss, changes in mood, tooth damage, and delayed puberty. Adults are more likely to experience celiac disease symptoms elsewhere in the body?including the skin, bones, and joints. 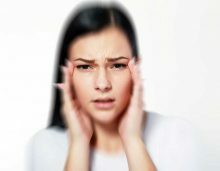 They may have bone or joint pain, sores in the mouth, an itchy skin rash, fatigue, anemia, missed menstrual periods, numbness and tingling in the hands and feet, weak bones, and headaches. It can be hard to distinguish celiac disease from other conditions that produce digestive symptoms, like irritable bowel syndrome, anemia, lactose intolerance, and diverticulitis. Further complicating diagnosis is that celiac disease symptoms vary from person to person, depending on the amount of gluten they eat, their age, how long they?ve had the disease, and how much damage has been done to their small intestine. A medical history, physical exam, blood tests, and tissue biopsies can help distinguish celiac disease from other conditions and confirm the diagnosis. Q. Is there a difference between celiac disease and wheat sensitivity? I’ve noticed that I get a little bloated after eating bread, but that’s my only symptom. Could it be celiac disease?